Hands were my least favorite thing to draw. I simply hated them, and I was so awful at drawing them. I found them an immense challenge, but I also realized how vital they are to an expressive drawing.. so I taught myself how to draw them. Now they are my favorite thing to draw. I've found that if you concentrate on learning the thing that challenges you most, it very often becomes you're specialty. Let's start with why I sucked in the first place, it goes back to Preston Blair's designs and pretty much the traditional "cartoon" hand.. studying designs like this will only lead to bad habits and a lack of anatomical understanding. 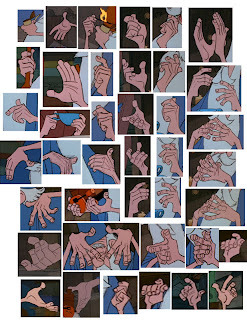 Instead, I would study Milt Kahls hands for Merlin in "Sword and the Stone", (great collection from the film above) . 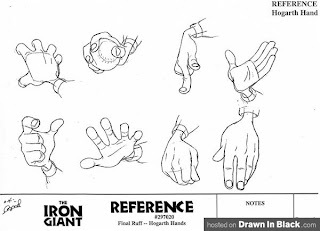 Milt managed to find a perfect blend of cartoon and anatomical design.. interesting side note, the hands in "Iron Giant" are also a great study. My buddy Randy Meyers told me that the Sword in stone designs for Wart were a huge influence on Hogarth. From there, I would suggest looking at how the great illustrators rendered hands. 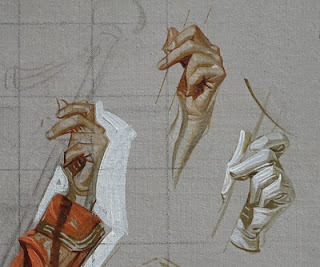 Leyendecker's studies are filled with beautifully illustrated, and dynamic hands. There are several books, most out of print, that are amazing as well. 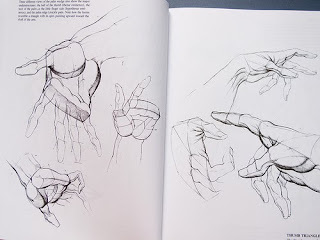 I would suggest the little green manual titled "How to Draw Hands" by Oliver Senior. It can be hard to find though. It was first published in the 40's. This series of books includes a lot of other great little "how to's", everything from drawing cats to wild flowers, no joke. My favorite is "How to Draw Fishing Crafts". so random! Furthermore.. 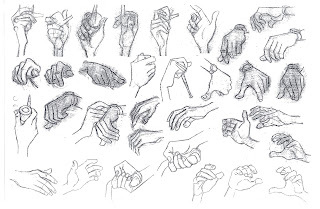 Some of my colleagues like Burne Hogarth's "Drawing Dynamic Hands" (above).. However, I find it to be too stylized, I think I learned more about how to draw tree trunks and vines with this book... hence very difficult to learn from, but others swear by it. Perhaps the most effective way I learned was to sit down and draw a solid page of hands in my sketchbook. I'm talking 50-75 hands per page.. make as many mistakes as you can, just repeat. I also think it helps to draw in ink, makes you commit to the line and draw quicker over all, which is of course very useful to an animator. I've always had trouble with hands, but I also love them when I do one that looks really good. I can totally see how they would turn from being really hard to being your favorite thing to draw. I think I need to sit down and do that filling-a-page hand practice you suggest. That Burne Hogarth book is indeed next to useless. The best anatomy book i know is Gottfried Bammes "Die Gestalt des Menschen", even for people who can't read german its well worth studying. The drawings of hands you admire were probably drawn by people who looked at hands, not drawings of drawings of hands. that's a fantastic image from S&tS... i'm going to study the hell out of that. MY milt kahl day! I was always kinda relieved that I learned many people hated drawing hands when they were my favorite. I felt like I had the, pardon the pun, "upper hand". I realize it probably helped I didn't study cartoon drawing when I started out in animation. I was in love with Miyazaki's films and their level of draftsmanship, as well as other anime bits years ago. In fact I learned much more about applied anatomy to animated characters through them than I did through Disney or other commercial Western cartoons. I will have to check out the book. What do you look for when you're choosing a drawing instruction book? I agree with Craig, start out with observing real hands.